In binary options, you can take advantage of various market conditions both when trending and ranging. Technical or fundamental analysis is not the only device that can be used to help you take advantage of differences in market conditions. Boundary options are one type of special trading that can be relied upon in sideways market situations. Boundary trading, or also known as a trading range is a type of option that allows you to estimate whether the price will remain or move out of the upper and lower limits of the price. Because the possibility of in-the-money is higher than other types of trading, not all brokers provide this type of trading. You can have a higher chance of success with boundary trading, because the specified price target will be more flexible compared to high / low and touch trading in binary options. The "in" option is placed on the basis of the analysis that the price will be within the upper price range and the lower price before expiry time arrives. While the "out" option will instead provide a wider choice of price targets, because your trading will end in-the-money as long as the price is not in the range when your option is printed. However, this option tends to be more profitable if you believe there will be a price surge. Therefore, the "in" option can be selected when the market is sideways, while options "out" can be determined to anticipate markets that are experiencing high volatility. As with other types of options, boundary trading also has provisions that vary depending on the broker that provides it. 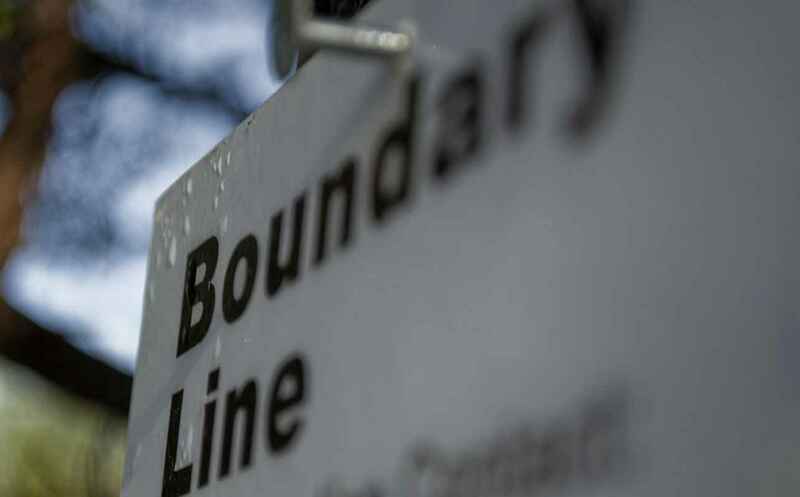 Therefore, it is important for you to know the different types and features of boundary trading. These types of options are generally determined by estimating whether prices will remain inside or move out of range. There are brokers who have provided the range, but there are also brokers who free their traders to set their own desired price limits. There are also boundary trading variations such as High Yield Boundary and "stays between / goes outside" which we will discuss one by one in the explanation below. Range In Boundary Trading: Get From A Broker Or Determine Yourself? Brokers generally have a comprehensive provision for each type of trading they have, where the determination of price levels set by the broker or which can be chosen by the trader applies to all types of trading provided. For those of you who do not want to bother to determine the price range can choose to trade at a broker that has determined the target range. Actually, giving a price limit by bro does not limit your freedom to make choices. There is still an "out" option if your analysis proves that the price will not be in the price range provided by the broker. In the example image above, you will gain profit if the price can move out of range when the expiry time is up. With the granting of limits from this broker, your trading strategy will also be more focused on the range-range that has been given, and just choose whether the range will be able to limit price movements ("in") or even the price will move beyond that limit ("out "). Conversely, there are also brokers who always provide options for traders to determine the desired price target. Binary.com, which provides a special column to set the high / low level and the target price for touch / no touch, is one example of a broker that is consistent in providing this freedom. 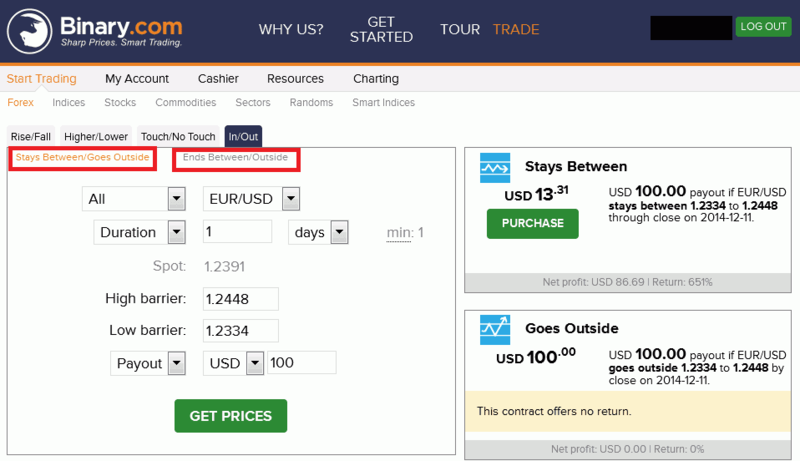 In boundary trading, Binary.com also allows traders to set their own desired price range. 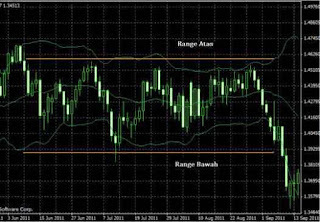 This type of course will be very suitable for you who have their own analysis to determine the range. Although a bit demanding specifications, but the results of the trading options that will come out will be more able to be accounted for psychologically, because you alone manage all aspects of the position of this option. Boundary trading is also modified into one type of High Yield Options which always gives a profit percentage at a fantastic level. Like the High Yield Touch, High Yield Boundary also has a profit return of up to hundreds of percent. However, this type of option is also traded with a higher risk. The main principle in this High Yield Boundary is, the narrower the range set, the greater the return profit that will be obtained. 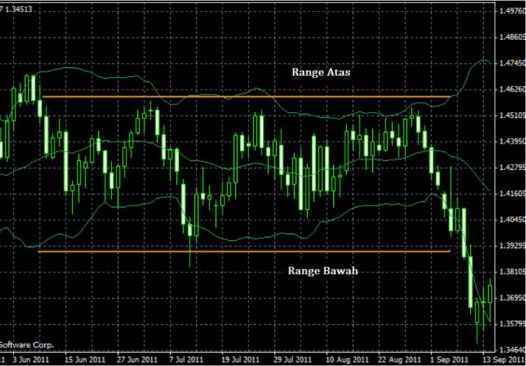 Of course the narrow range will also minimize your trading opportunities, because the time and type of instruments given are fewer, and the range specified is usually narrower. However, you can use this method to the fullest and safer if you have a proven trading system. For those of you who are just starting out in binary options, practicing on ordinary boundary trading will be able to increase your ability to trade in this type of High Yield. The "stays between" option in trading boundary is determined by estimating whether the price will move within the price range as long as your option period is valid (before expiry time). The "goes outside" option will end in-the-money if the price can move out of range while the option is running. 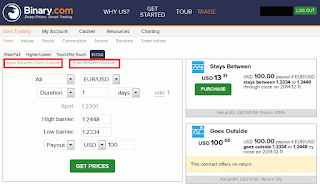 One of the binary options brokers that provides variations in boundary trading is Binary.com. However, this broker does not provide a return on the type of trading "goes outside". Not all brokers provide the same choice as Binary.com. Therefore, you need to really understand the provisions of the types of options provided by your chosen broker. In this example, it can be seen that the upper and lower channels displayed by Bollinger Bands when sideways prices can be the upper and lower range for boundary trading. In addition, there are also lines of support and resistance that can be obtained from the fibonacci retracement and pivot points to determine the right price range. Although sideways often occur in price movements, there are times when prices respond to news releases that display results that are beyond expectations, thus creating a new trend after having been ranging for a while. It will be very dangerous if you place the wrong option and expiry time. For this reason, getting to know the fundamental side of an instrument will greatly influence your chances of success in this type of trading. You can learn what data can affect the price movements of the instruments you are trading. Knowing the right time to avoid price spikes due to the release of data also needs to anticipate the error of options placed on boundary trading. You can find out all that through the economic calendar provided by many financial sites today. Learn to trade on the types of options provided by your binary options broker on a demo account. If your broker does not provide it, use small amounts of capital to limit the risk at the beginning of trading. Think of these small costs as learning costs, which can later be developed into more profits. Traders who have preparations will be more able to accept the trading risks they face. This does not mean that your option only has a small chance. Risks will always be there, provided they can be anticipated and controlled properly, you will be able to master binary options trading more convincingly. If you always feel unsure of your options because there is no preparation, the potential for success in achieving binary options will also be smaller. Therefore, for each type of trading that you choose, reach the opportunity for profit with planned trading analysis. In addition, establishing a measured trading fund management will also help you to maintain your binary options trading account.